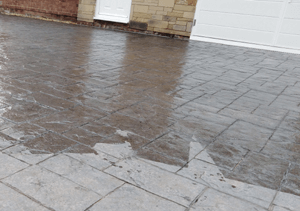 "We're driveway cleaners in Chester (and surrounding areas) who restore driveways to bring bedraggled gardens back to best. Get a quote for our restoration service including a free external clean of your home too." Driveway cleaning at its best. Free exterior property clean included. Driveway cleaning in Cheshire including Chester, Northwich, Nantwich, Ellesmere Port, Wrexham, North Wales, Mold, Buckley, Runcorn and Frodsham areas. Free external clean with our driveway clean? The majority of driveway cleaners provide a basic level service, but our unique service gives a full external clean too. It's like the painters have been in, but far cheaper. Our fantastic external cleaning service will leave your whole house all shiny and new again, not just your driveway. Additionally, our driveway cleaning service gives your drive and patio a 'better than new' look. Brand new drives have a sandy-strewn about them. We seal your driveway with a 'top of the range' sealant that not only give the restoration a professional finish but additionally protects it long-term. "We're happy that you made our driveway look new again." Day 1 - Deep clean pressure-wash.
Day 2 - Weed treatment and re-sanding. Day 3 - Chemically sealed (optional). (Prices vary depending on size). The importance of weed treatment. Not all driveway restorations include weed treatment and weed treatments are not the same. One of the issues with weeds in driveways is the roots can travel deep down under the blocks. Standard weed treatments don't always affect the root system, and that's why I use a special non-standard treatment instead. Eco-weed treatments are available, but not recommended. Why I'm Chester's most recommended driveway cleaner? My external cleaning service has become popular because people want to keep the outside of their homes cleaned too. I can give your property a full external clean included in your driveway clean. Many people are so impressed; they regularly keep me as their regular window cleaner. How many driveway restorations have you done? Initially, I was regularly asked by my regular window cleaning customers to powerwash their driveways. With many recommendations from those original customers, I began restoring driveways large and small on a more professional basis. Today, I've lost count, but regularly see my work around and about when I travel around Chester. What type of driveway surface do you restore? 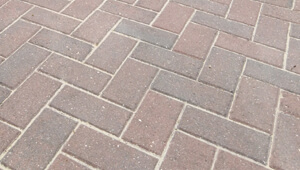 Block paving is the most common type and is the most labour intensive. Concrete drives became famous throughout the 1990s and early 2000s and many are beginning to look a little bedraggled nowaday's. Tarmac drives get restored, but this depends on age and condition. Stone patios are becoming common today but require annual maintenance. We can quote for all types of surface and sizes. What's the benefit of a seal coating? Driveways without a seal coating become exposed to the elements and humanmade spillages. I spilt car wax on my friend's three-week-old drive. I can still see it ingrained in the blocks pores to this day. Seasonal environmental bombardment is inevitable, but with a seal coating, it can be cleaned far easier going forwards than without a protective coat. What about maintaining a sealed driveway? Beauty is in the eye of the beholder, but an aesthetically pleasing garden is the equivalent of nice clean alloy wheels on a car - complementary. Future maintenance becomes a doddle once a nice clean, stain resistant surface is applied. Dirt and moss will fall away easily with a quick surface clean. "What a difference it made to the garden. Thanks for your efforts."